Bread for the World members visited Capitol Hill on June 7 to advocate for child and maternal nutrition programs in the United States and around the world. 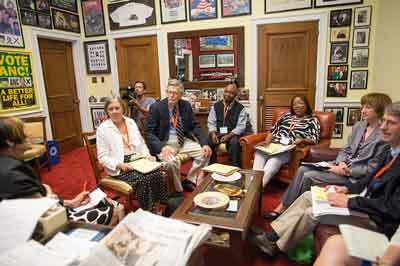 These “faith lobbyists” urged members of Congress to pass the Global Food Security Act of 2016 (S. 1252) and increase funding for global child and maternal nutrition programs. They also asked lawmakers to work toward a bipartisan child nutrition reauthorization bill that improves and strengthens child nutrition programs in the U.S. The bipartisan Global Food Security Act would help hungry nations develop smart, long-term agriculture programs so they can independently meet the nutritional needs of their people. Many of these programs would focus on activities that directly improve the nutrition of women farmers, their families, and their children. In the U.S., one in five children lives at risk of hunger. Yet the child nutrition reauthorization bill currently before the House of Representatives would potentially deny tens of thousands of eligible children access to the healthy meals they need to learn and grow. At an evening reception at the House Cannon office building, Bread for the World honored Reps. Sam Farr (D-Calif.) and Kay Granger (R-Texas), and Sens. Lisa Murkowski (R-Alaska), and Debbie Stabenow (D-Mich.) for their leadership on issues affecting hungry and poor people in the U.S. and around the world.